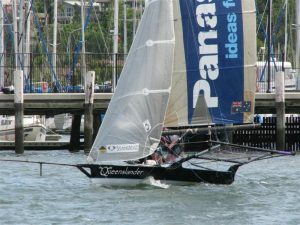 Winged 18 foot skiffs have returned to sail from the home of 18 foot skiff sailing in Brisbane, the Brisbane 18 Footers Sailing Club. During the off-season, a deal was struck with the Australian 18 Footers League to have two of the “retired” boats head north of the border. These boats were picked up over two trips to Sydney. Both are in good condition and will be “dressed up” before sponsorship is sought out. Our aim is to sail these boatsregularly in the lead up to the J.J. Giltinan World Championship, held in Sydney from February 15 to 24, 2008. See our Sailing Season Program for dates of when the “Open 18s” sail here at the Eighteens. One boat skippered by Rear Commodore Darryl Dignam will be known as “Queenslander”, the second “Red Rocket” (formerly “Avaya”) will be skippered by Sandgate’s Laurie Williamson, who also skippers a Historical 10 at the Club. Both teams are pretty well wearing the “L” plates off the stern at the moment, but are continually improving with each hit out. We wish them all luck!